I’m trying to remember how I chose this oyster dish to start our Christmas Eve meal last week. There’s an entire chapter devoted to oysters in John Besh’s My New Orleans, and I wanted to make every single recipe. I believe I decided to try this one first just because it’s so incredibly easy and it wouldn’t keep me in the kitchen for long. The oyster gratin could also have been served as an hors d’oeuvre with the breadcrumb topping applied to each half shell, and it wouldn’t have taken much longer. The oyster and artichoke soup could have mostly been prepared in advance and would have been delicious. The crispy fried oyster salad was another option, but I’d love to get some Louisiana caviar to present that dish properly. And, that’s just some of the oyster chapter. The book is divided seasonally starting with crawfish and Mardi Gras dishes, moving on to feast days and shrimp season, then fish followed by summer vegetables and crab season. There’s a chapter for gumbos and one for Thanksgiving, one for pork since Chef Besh raises his own hogs, and a final chapter for Reveillon or the feast served on Christmas Eve. It’s a beautiful book, and I’m enjoying cooking from it. For these oysters, the intention was to grill them to impart some smokiness, but I was too lazy for that. I broiled them instead. A compound butter was made with garlic, crushed red pepper flakes, chopped chives, thyme leaves, and lemon juice. Slices of that butter were placed on top of each shucked oyster in its half shell, and then the oysters were broiled for a few minutes until they started to curl. They went from broiler to plate to our mouths in minutes. These were simply fresh, spicy, and garlicy, and I should have made a dozen or so more than I did. I can’t wait to taste them off the grill when I make this again. I’ve tried a couple of other things from the book including the fall greens salad with blue cheese and pumpkin seed brittle. The vinaigrette with sherry vinegar and walnut oil was nutty and lovely with the blue cheese and cayenne-spiced pepita brittle. Also, the green tomato and pepper jam was sweet, tart, spicy, and just what some goat cheese on crostini needed. I’m already looking forward to Mardi Gras and strawberry season and all the other reasons to use this book throughout the coming year. Just bought John Besh's book - what an incredible depiction of New Orleans. Although I am not an oyster fan, your photos are wonderful. I must add New Orleans to my bucket list. Happy Holidays! Gorgeous photos! Saw this one on Foodie Views. I don't even like oysters, but I wanted to eat these, they looked so good! Wow just look at that nice glob oF butter on that oyster. I must get me this book!!!!! Ive never had oysters but always wondered what they taste like. This one looks super tempting. Have a fabulous new year daaaaaaaahling. well...i just ADORE oysters and these look incredible. am wondering how hard they are to shuck at home. i must get my hands on besh's book also. 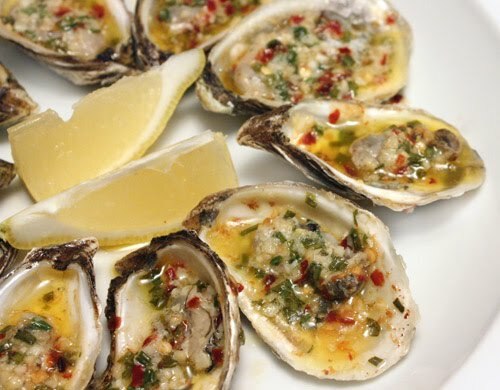 Oh my, you had me at oyster - cannot wait to try this recipe. I've had my eye on the cookbook but have not had the chance to check it out in detail yet. Thanks for sharing and I hope you have a truly spectacular New Years! There are few foods that I simply cannot eat and well, oysters is one of them... It's just not my cup of tea so to speak but yours do look lovely! 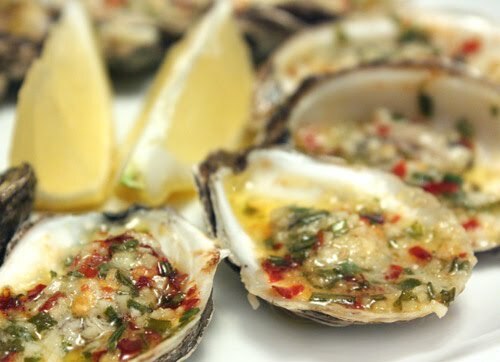 I love oysters and your recipe sounds great! I wish you a wonderful happy holiday and a very Happy New Year 2010. Best wishes! It looks beautiful and great presentation. My best wishes to you and your family for the New Year. Gorgeous! Love the flavours and the presentation is beautiful! You are just amazing. Really. I'm speechless. These look perfect to a t.
These look sooo good. I love oysters. And they are so easy to prep. Great photos, too. The Besh New Orleans cookbook was on my wishlist... and I may have to pick it up as a present to myself for 2010. These oysters look heavenly! I LOVE this! I've been obsessed with oysters ever since I once had them fresh-shucked and raw. I love the minimal, fresh ingredients in this! Happy, Blessed, Joyful New Year!! Absolutely love this! Will try it someday. Happy New Year to you and best wishes! Your oyster dish looks unbelievably delicious! Mmmmm, purty pictures! You might want to explore Robb Walsh's book on oysters also. Now I want oysters...ahhh a nice glass of wine, and some of these will do for me thank you! Neither one of us really liked oysters until eating them raw during the Foodbuzz Festival. 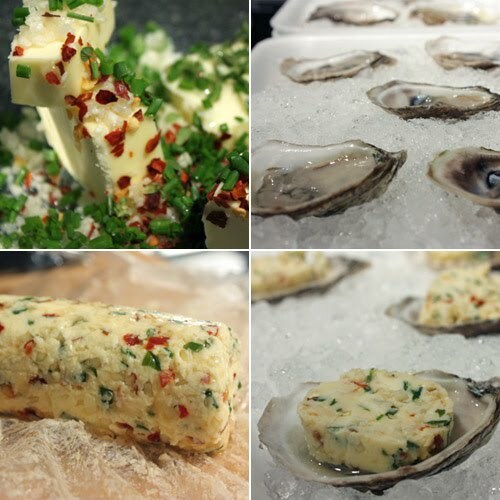 This looks like an easy recipe to replicate at home for new oyster lovers! Neen: I actually bought the oysters shucked and on the half shell. I've never tried to shuck them myself.